The ketchup splattered, dog-eared restaurant menu is dead. Say goodbye to the sticky Fanta-stained specials list, the extravagantly oversized à la carte menu and even the glossy takeaway leaflet positively dripping with saturated fats. They’re all dead too. The ritual of walking into a restaurant, running your finger down the selection of dishes on offer, raising your hand and dictating your order while a waiter dutifully scribbles it all down is on its way out as well. Soon to be a custom as archaic as making a call at a telephone box or conversing with strangers. This is, of course, a rather extreme way of looking at things. Walk into a restaurant today and there’s a 99.9% chance you’ll be presented with a traditional menu over a VR headset. But things are changing gradually and how we interact with restaurants and their food is fundamentally changing. And smarter menus are at the forefront of it all. We already have digital menus of course. US fast-food giant McDonald’s has been rolling out self-ordering kiosks since early 2017 across thousands of its global restaurants. Meanwhile, their fast food foes over at Burger King have been pioneering digital menu screens since 2011 and in London healthy eatery Tossed has opened a cashier and cash-less restaurant. Not to mention the millions of people around the world using apps such as Deliveroo, Delivery Hero or Meituan Waimai to sift through culinary options and get their dinner delivered on demand. It's not just food ordering that's getting disrupted either. Apps even mean potential diners can eye up a restaurant's menu without ever stepping into a venue or hunt for cuisine-specific deals from the comfort of their own home. At hedgehog lab we have experienced this disruption up close having partnered with London-based startup dines to develop their restaurant deals ordering app. Providing location-specific discounts, ordering and bill splitting, the app is one of a huge slew of hardware and software solutions currently upending the market. More and more people are comfortable browsing, ordering and even paying for their meals through a digital interface. In fact, they've even come to expect it, with Millennials in particular lapping up the convenience offered by digital food ordering. In an industry defined by its tight margins and high overheads, the potential of technology-based alternatives to the humble menu are huge, providing opportunities to make more money per customer and get even more rumbling stomachs through the door. Eateries across the world are already experimenting with and implementing solutions that harness the latest innovations and point towards where we might be heading. Photo by Interactive Restaurant Table. London-based Asian restaurant inamo has pioneered interactive tables since way back in 2009. Its well-publicised focus on providing a futuristic dining experience, replete with touchscreen tables, in-built games and live footage from the kitchen, has proven a hit with diners and posed a point of differentiation in one of the most crowded restaurant scenes in the world. 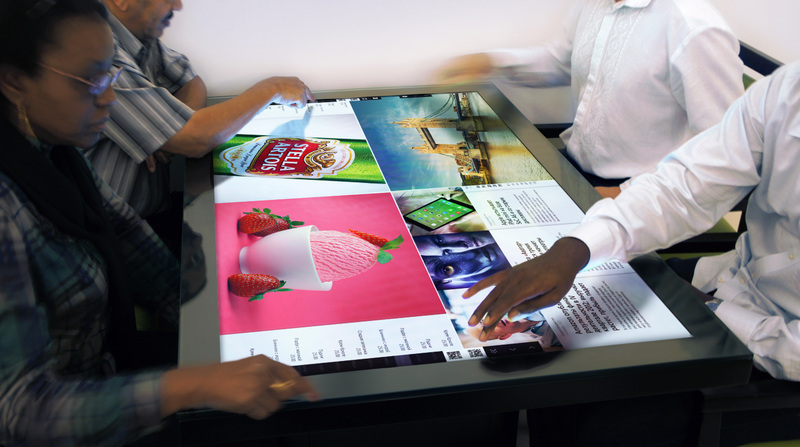 The tech’s introduction marked the early adoption of touchscreen table innovations which have come on leaps and bounds in recent years. One of the front runners is Ukrainian firm Interactive Restaurant Company which has developed cafe and restaurant tables with in-built touchscreen 4K displays, while Pizza Hut has been trialling similar technology in its US restaurants since 2014. Photo by Clotee Pridgen Allochuku / CC BY. Companies including Ziosk and PrestoPrime have developed on-table tablet devices which support the whole customer journey, from menu browsing to ordering to payment, with major US chains such as Applebees, Outback Steakhouse and Chilis all rolling out the devices in their restaurants. The benefits of such innovations are obvious: quicker ordering times and quicker table turnover meaning more customers through the door. Inbuilt games and entertainment options also provide restaurants with another bonus revenue stream and can often see the devices paying for themselves after a few months. Photo by Jenna Day on Unsplash. App developer Kabaq has partnered with burger chain Bareburger in the Middle East to pioneer an augmented reality menu through Snapchat where users can inspect a photo-realistic 3D representation of menu choices before they order. The firm has also worked with New York wine bar Vino Levantino to map in 3D their selection of exotic Middle Eastern desserts. By giving customers the chance to inspect unusual menu options before they order, the establishment claims it has enjoyed a 22% increase in sales since introducing the technology. The tech is driven by Snapchat's Lens Studio feature, launched last year, which has opened up significant opportunities for restaurants to adopt their own AR-powered menus. Photo by jason_one / CC BY. In France, the Skullmapping creative collective has utilised projectors to entertain diners with animations of their food being prepared directly on their plates. By combining narrative with dining the team have shown how the tech can make that interminable wait between ordering and feeding a whole lot more bearable. In more practical implementations of the technology, the aforementioned inamo also utilises projectors to make menu options magically appear on diners' plates and give them a better idea about what exactly they are ordering. Meanwhile, New York-based tech firm Lampix has developed a unique AR system which can turn any flat surface into a smart interactive interface. From collaborative working to retail, the tech has a wide-range of potential uses, but it's the restaurant industry where the potential is perhaps greatest. Where other approaches require expensive hardware or furniture, Lampix's software and hardware uses widely available components and can be more easily integrated into current venues with less upheaval. On-table ordering and menu selection are just some of the possible uses of the technology that the firm says it is trialling with 'top-tier' restaurant operators. Digital menus in the form of on-table tablets and ordering kiosks are already unlocking significant benefits for restaurants. In particular, the adoption of tabletop technology has been linked with higher tips for servers and increased per customer spend. A tablet won’t judge you for ordering a mammoth slab of brownie straight off the back of a double quarter pounder with fries after all. Such is the upselling potential of connected digital menus that Ziosk claims its clients have enjoyed a 30% jump in dessert sales following the introduction of tabletop tablets. The potential extends beyond shame-free dessert ordering too, with impersonal technology immune to the fallibilities of human beings and far more effective at upselling consistently. Looking even further ahead, digital menus open up even more tantalising possibilities for operators. Personalised AI-powered menus that adapt depending on the customer could provide targeted dining options that result in higher customer spend. Dynamic menus that change options and pricing depending on stock levels or that day's catch. We'll soon be wondering why we stuck with the outdated cardboard menu for so long. There are pitfalls to all of this of course. The digitisation of menus is part of a wider trend towards self-service and automation similar to what we have seen in retail. If diners are handling menu selection, ordering and payment themselves through all-encompassing devices, other than serving their food and taking their plates away, what use is a server? The counter-argument goes that the new technology will complement rather than replace traditional restaurant staff as servers continue to seat guests and clear tables. However, it’s clear that tech such as on-table tablets will have some impact on staffing levels and the opportunity to reduce staffing costs will be a key driver of adoption in the industry. In the US, Steve Weigel, the CEO of Cerca Trova, one of the leading Outback franchisees, has claimed that Ziosk's units have entailed a ‘one or two percent’ saving in labour costs by giving venues the opportunity to run fewer servers on any given night. Photo by Nick Hillier on Unsplash. For restaurants this is something of a no-brainer. Staffing costs are one of the biggest overheads in the industry and venues will always be on the look out for ways to either reduce their expenditure on employees or, at the very least, make their workforce management more efficient. That being said, there will always be demand for the personal touch and early adoption of digital menu technologies such as on-table tablets have modified the role of servers rather than made them redundant entirely. Whether this continues to be the case once digital menu innovation becomes more sophisticated remains to be seen. As innovation sweeps through the industry, consumers’ expectations are going to change with it. Diners are always going to desire convenience and restaurants are always going to look to cut costs and save money. As long as new technology fits one (or preferably both) these factors it will inevitably prove a tempting proposition for restaurateurs. Realistically, not every restaurant is going to feel the need or inclination to do away entirely with the humble menu nor are they going to see the benefit to forking out on new technology. For the larger chains and bigger names, however, the imperative to innovative will become overwhelming in the coming years. Busy, time-pressured customers will expect digital innovation and demand that their favourite restaurants give them quicker and more convenient options, and it's vital that eateries listen to them. Just as those restaurants who fail to keep up with consumer tastes can find themselves on the wrong end of a customer backlash, outlets resistant to innovation could find themselves staring into the abyss as diners vote with their feet. It's not just the hospitality industry that is being shaken up by innovation, retail is too. Learn more about the enormous benefits of apps for brick and mortar retailers.